Thanks to TCM and Fathom Events we got to see Singin' in the Rain (1952) on the big screen! And at a local theater at that! There are two cinemas in my area and neither of them show classic films. I usually have to go further into the city to see one. But for one special day, the AMC theater in the next town over showed Singin' in the Rain! The performance started with an introduction from TCM's Robert Osborne and was followed by an interview with Osborne and film star Debbie Reynolds. It was intermixed with other pre-recorded interviews, much further in the past, by the widow of Gene Kelly, Donald O'Connor (from 1997) and Cyd Charisse (2003 I think). Debbie Reynolds was wonderfully candid, made lots of fun remarks and wasn't afraid to poke fun at herself. She referred to herself as a virgin in a town with a whole lot of them and mentioned that her only regret was that her voice was way too high in the film. There were a lot of tidbits of information shared. For example, the famous Make 'Em Laugh sequence performed by Donald O'Connor is the only dancing piece in the whole film that wasn't choreographed by Gene Kelly. Kelly knew that O'Connor would be able to choreograph his only solo piece and let him have at it. And the result was truly glorious. During the TCM opening, we got to see lots of pictures from behind the scenes as well as publicity stills. 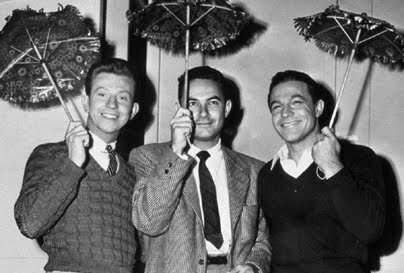 I really loved seeing this picture of Donald O'Connor, director Stanley Donen and Gene Kelly with tiny umbrellas. It made me laugh! I was briefly reminded how amazing it was that I got to see Stanley Donen in person! Then it was on to the main event. The film! Oh how wonderful it is to see Singin' in the Rain in all it's Technicolor glory and on it's 60th anniversary. The film was shown in it's original aspect ratio of 1.37 : 1. There were about 40 or so people in the theater and we all applauded after Donald O'Connor's Make 'Em Laugh scene (it's also my favorite number in the picture) and at the very end. The long 16 minute (or so) musical sequence with Gene Kelly and Cyd Charisse is the perfect time to go to the bathroom or take a quick snooze. To me that sequence has always been a showcase of Gene Kelly's larger-than-life ego. It's a bore in the midst of what otherwise was a great film. I did however come to appreciate the small number in the sequence with the flowing white fabric that Cyd Charisse wears. It's so long and it took several well-positioned fans to get it to flow back, side to side and straight up to the ceiling like it did in the number. I made sure to pay attention to that. There were a few things I noticed during this viewing of the film. I totally forgot that Rita Moreno is in the film (as Zelda). On the marquee of the theater on the big opening night for The Dancing Cavalier it said All Talking! All Singing! All Dancing! which made me think of my friend Jonas the Talkie King. Also when they are premiering the bomb of a talkie The Dueling Cavalier I spotted William Haines' name on one of the posters behind the actors. It's those little things I like to pick up on. And I don't want to be remiss and not mention Jean Hagen who I think is a marvelous delight in the film. We just all love to hate her. Carlos asked me if that was her real voice and I was happy to tell him no that it's not. However, Debbie Reynold's Kathy Selden who dubs Hagen's Lina Lamont is dubbed herself while singing. Ahh Hollywood! You can be so silly sometimes. There truly is nothing quite like watching a beloved classic film on the big screen. I thank Fathom Events and TCM for giving me the chance to watch one of my favorites this way! Excellent write-up! Everyone applauded after Make 'em Laugh and Good Morning numbers and at the end. But lots of laughs as well. I've seen it dozens of times, but it is so different on the big screen- a whole different dynamic. I'm so jealous! The only places around here showing it were both over an hour away, and I didn't find out early enough in order to get off work. Glad you got to see it on the big screen! We had a great time - and a packed house - when we saw it here in our town in July.